1748~1768: born in Ôsaka. He started his career in hama shibai, performing at the Takeda no Shibai under the name of Takeda Tokizô. 7th lunar month of 1768: Namiki Shôzô I's drama "Yadonashi Danshichi Shigure no Karakasa" was staged for the first time in Ôsaka, at the Takeda no Shibai, a koshibai venue; Tokizô played the role of Manriki Ichiemon [casting]. 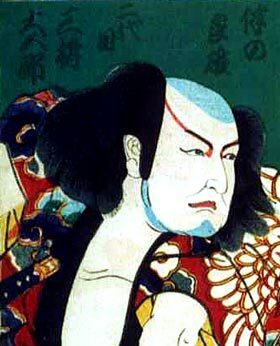 End of the 1760s, beginning of the 1770s: he became disciple of Fujikawa Hachizô I and his stage name was changed to Fujikawa Tokizô. 11th lunar month of 1772: Tokizô made his debut in ôshibai, playing in Kyôto at the Minamigawa no Shibai the role of Hangan Terukuni (a katakiyaku role) in the kaomise drama "Ôsaka Zaiku Araki no Mokuzô", which was produced by Yoshizawa Iroha I. 1774: he was adopted by Mimasu Daigorô I and took the name of Mimasu Tanin II. 4th lunar month of 1775: premiere in Ôsaka at the Naka no Shibai of Nagawa Kamesuke I's drama "Hade Kurabe Ise Monogatari"; Tanin played the roles of Ikaruga Tôta and Nyôhachi [more details]. 4th lunar month of 1777: premiere of Namiki Gohachi's drama "Tenmangû Natane no Gokû", co-written with Nakamura Akei and Tatsuoka Mansaku, which was staged at the Kado no Shibai; Tanin played the roles of Miyoshi Kiyotsura and Aratôta [casting]. 29th day of the 12th lunar month of 1777 : his first master Fujikawa Hachizô I died. 25th day of the 9th lunar month of 1780 : his adoptive father Mimasu Daigorô I died. 3rd lunar month of 1781: Mimasu Tanin II took the name of Mimasu Daigorô II at the Naka no Shibai, playing the role of Furuteya Hachirobê in the drama "Mukashi Gatari Nise no Omokage". 1st lunar month of 1782: Daigorô's rank in the Ôsaka hyôbanki, tachiyaku section, was jô-jô-(shiro)kichi (superior - superior - (white) excellent). 1st lunar month of 1784: premiere at the Naka no Shibai of Namiki Gohê's drama "Keisei Yamato Zôshi"; Daigorô played the role of Futami Sehei [casting]. 5th lunar month of 1788: first Kabuki adaptation of the puppet theater drama "Hikosan Gongen Chikai no Sukedachi", which was staged in Ise at the Furuichi no Shibai; Daigorô played the role of Rokusuke [casting]. 9th lunar month of 1791: premiere of Nagawa Shimesuke I's chûshinguramono "Iroha Gana Shijûshichi Moji" in Ôsaka at the Kado no Shibai; Daigorô played the roles of Ishidô Umanojô and Teraoka Heiemon [more details]. 1st lunar month of 1793: Daigorô's rank in the Ôsaka hyôbanki, tachiyaku section, was one black stroke above jô-jô-(hanshiro)kichi [visual]. He shared the same rank with Kataoka Nizaemon VII and Mimasu Tokujirô I. Premiere at the Naka no Shibai of the ni-no-kawari drama "Keisei Yanagi Zakura", the first yanagisawa-sôdômono in Kabuki history, written by Tatsuoka Mansaku and Chikamatsu Tokusô; Daigorô played the roles of the Uesugi kerai Kizu Sekibê and the nakama Sakusuke [more details]. 5th lunar month of 1793: Daigorô appeared on stage for the last time, playing at the Naka no Shibai the role of Kiya Uhachi in the drama "Kyô Miyage Meisho Izutsu". 27th day of the 7th lunar month of 1793 : Daigorô died in Ôsaka . Mimasu Daigorô II was a talented Ôsaka actor, who achieved fame for himself in Kamigata from the end of the 1770s to the beginning of the 1790s. His vocal projection and his voice were very good and he excelled in sewamono dramas in otokodate or sumôtori roles. The 27th day of the 7th lunar month of the 5th year of the Kansei era was the 2nd of September 1793 in the western calendar. The 29th day of the 12th lunar month of the 6th year of the An'ei era was the 27th of January 1778 in the western calendar. The 25th day of the 9th lunar month of the 9th year of the An'ei era was the 22nd of October 1780 in the western calendar. His tombstone was located in the precincts of the Myôjuji Temple in the district of Nakadera.